Embodied agents have a material existence whilst audiences share this very same world and space. 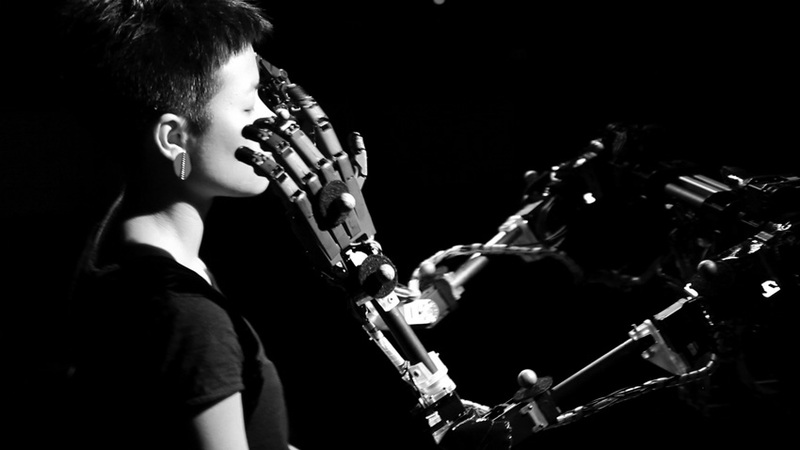 This lecture explores the far-reaching and often surprising implications of embodiment, both from the perspective of the audience and of the robotic agents in Robotic Arts, which empower intangible contributions from the cultural context, the suspension of disbelief and the attribution of intention towards any outside physical objects acting upon the world. The ShanghAI Lectures are a videoconference-based lecture series on Embodied Intelligence, run and organized by Rolf Pfeifer (from 2009 till 2012), Fabio Bonsignorio (since 2013), and me with partners around the world. Louis-Philippe Demers makes large-scale installations and performances. His main areas of work are entertainment robotics and interaction design. Over the past two decades, he participated in more than seventy artistic and stage productions and has built more than 300 machines. His projects can be found in theatre, opera, subway stations, art museums, science museums, music events and trade shows. Demers’ works have been featured at major venues such as Lille 2004, Expo 1992 and 2000, Sonambiente, ISEA, Siggraph and Sonar. He received three mentions at Ars Electronica, the Distinction of Prix Ars 96, the first prize of Vida 2.0, a mention for the Tiller Girls at Vida 12.0, the Interactive prize for Lightforms 98 and six prizes for Devolution including two Helpmann Awards, the Australian equivalent of the Broadway’s Tony. Demers was Professor of Digital Media and Exhibit Design/Scenography at the Hochschule fuer Gestaltung, the academic institution affiliated to the world renowned Zentrum fuer Kunst und Medientechnologie (ZKM, Germany). Since he joined the Interaction and Entertainment Research Centre and the newly founded School of Art, Design and Media at the Nanyang Technological University (NTU, Singapore). The ShanghAI Lectures have brought us a treasure trove of guest lectures by experts in robotics. You can find the whole series from 2012 here. Now, we’re bringing you the guest lectures you haven’t yet seen from previous years, starting with the first lectures from 2009 and releasing a new guest lecture every Thursday until all the series are complete. Enjoy!